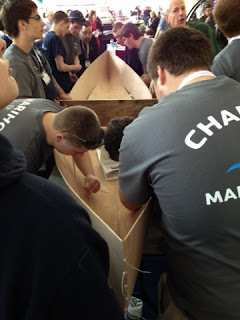 Given all of this cold weather lately, it's about time someone gave us our sailing fix. For the first time in a long time, the Providence Boat Show contained some sailboats. LaserPerformance, Zim, RS Sailing and even JBoats and Hunter had boats on display. The International Yacht Restoration School had a Moth on display, while students from Tiverton (Ri) High School built a stich and glue canoe from scratch during the show. 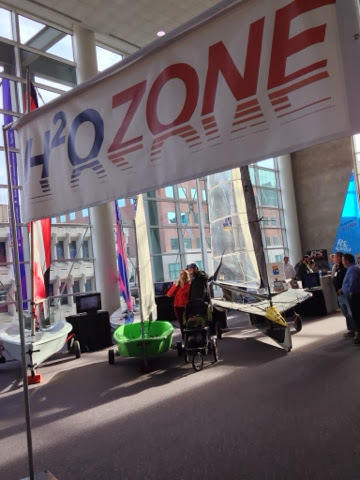 LaserPerformance had almost their entire product line on display, with videos showing their newest boat, the Z420, although oddly, they had only a C420 on display. They explained the lack of Z420’s was due to the fact that they are selling them fast than they can make them. They are also making a major push to outfit youth programs with Zumas and Sunfish. Zim Sailing hasn't been idle either. 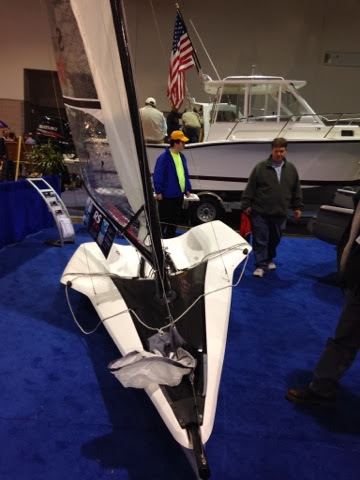 Bob Adam from Zim told us that just this week, they became a North American distributor for the 29er. They are also offering repair services for all makes and models at their factory in Bristol. 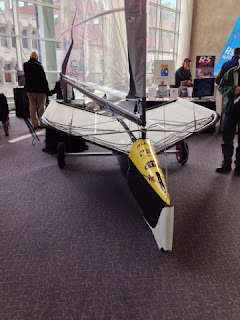 British based RSSailing had most of their line on display, including the phenomenal single handed skiff, the RS100. They have a thriving class in Europe and are trying tobuild a presence in the US. 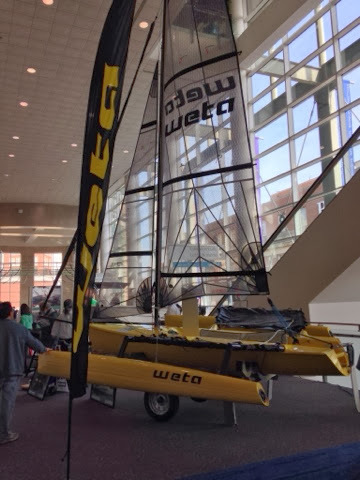 Weta had their single handed trimaran racer on display. It was refreshing to see sailboats return to the Providence show after an absence of several years. Let's hope that the trend continues. Great post. Thanks very much. 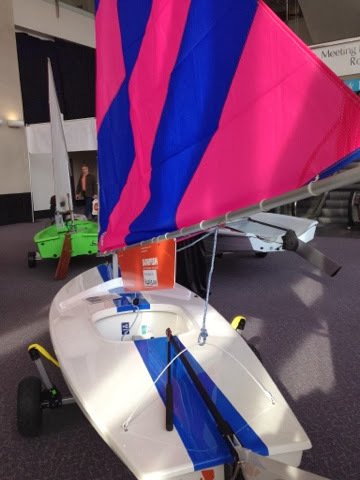 Had to miss the show as we are visiting family in CT.
Good to see that RSSailing are still trying to attack the US market. I hope they succeed. I sailed the RS100 a couple of years ago in Europe and it really is a lot of fun. 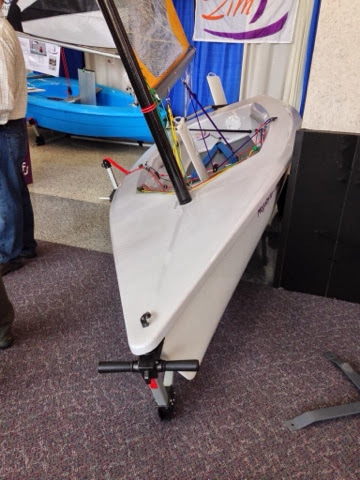 If there is interest in a local fleet takes off I would buy one. I think it would be match racing between you and me for a while. They want to build the Feva first, because they think that the $13,500 price tag for the RS100 is a bit steep for the US market right now. It is a bit steep compared to a Laser or a Sunfish, say. But you get what you pay for. Were they implying they might drop the price in a year or two?